Which singular city block has the city's best, and most varied, assortment of restaurants? 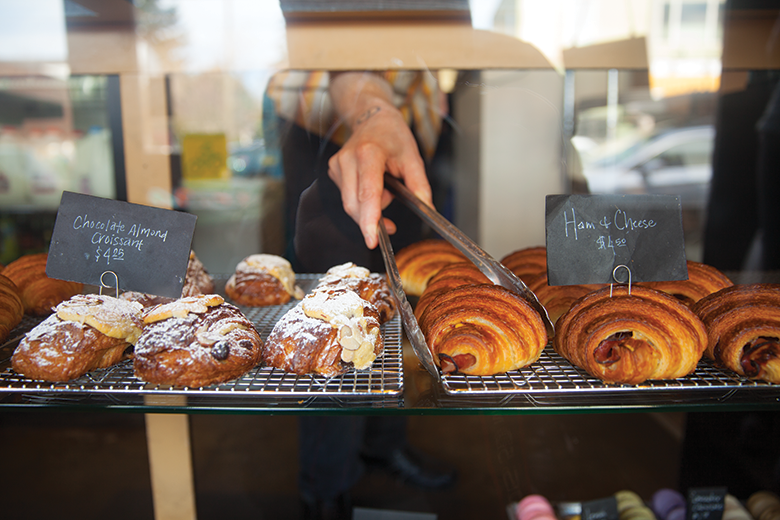 Rosellini's bakery and The Fat Hen form an unstoppable breakfast duo along one of Ballard's foodie-friendly blocks. How often do you eat in your own neighborhood? People all the time ask me where I eat out most frequently, and the answer is less about the restaurants I think are the best in the city, and more about the pizza place around the corner and the family owned Hawaiian joint down the street. These are busy times, and proximity rules. Well, we thought it would be fun to play a little game: If you had to eat every meal within one Seattle city block for a year—or a lifetime—which block would you choose? We’re taking out of consideration most of Ballard, Capitol Hill and downtown because… too easy. It has to be a single block—NE 65th Street in Ravenna between Third Place Books and Salare, for example, is epic, but spans three different blocks. As is Stone Way, for the cluster that includes Joule, Whale Wins, Manolin and Sea Wolf. Again, more than one block. We’ve already written about our love of this micro ‘hood, which includes pastries at Rosellini’s (formerly Honore), cocktails and great burgers at Essex, pizza at Delancey, baked eggs at Fat Hen, soon plant-based ice cream when the new Frankie and Jo’s opens. 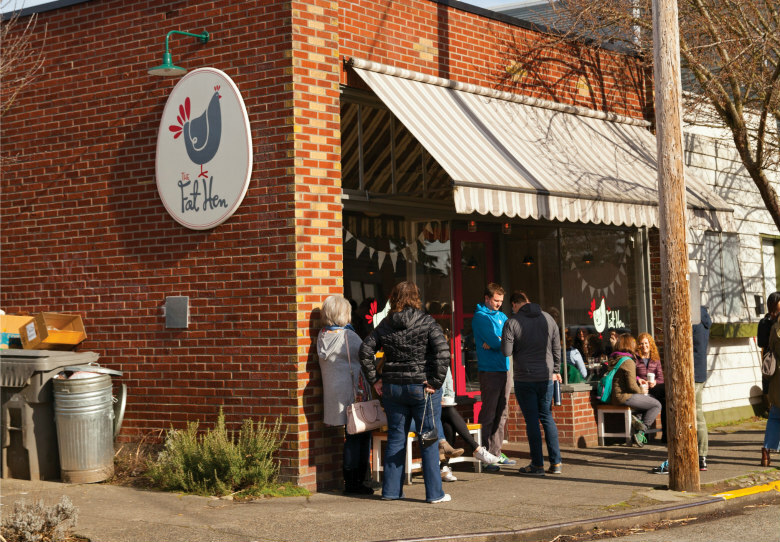 This is a long block, outside the popular Pike/Pine corridor, that somehow finds space and customers to support THREE coffee shops—Caffe Ladro, Ada’s and Victrola—which is a-ok in our book. There’s also Wandering Goose and Rione XIII. The other side of the street is a whole lot of nothing, and that doesn’t even matter. In our hypothetical situation, calories don’t count. So we’re all in for any block that features so much booze (Noble Barton), barbecue (Drunky Two Shoes), ice cream (Full Tilt), pho (Pho White Center), tacos (Los Potrillos 4) and pizza (Proletariat). It’s a tossup. Is it better to head north at this junction? Or south? One way has Bakery Nouveau and Mashiko, the other (a block up) has Ma’Ono and new Supreme pizza. We’re voting south for the balance: morning almond croissants, evening sushi. This block is just so delightfully Seattle right now: 45th Stop and Shop poke, sweets from Cubes Baking, pho at Than Bros., some excellent dinner options at Kabul Afghan, plus both teriyaki and Ezell’s fried chicken. Hey, at least you’ll never get bored from lack of flavor options here, with Columbia City Bakery, Geraldine’s, La Medusa and Island Soul. There are obvious holes here—we couldn’t settle on a fave International District block. Or Pioneer Square. That’s where you come in. Share your picks, or weigh in on one of ours, here.